Bali is an extravagant spot with some somberly lovely places. The compelling force of nature has given all its energetic viewpoints in Bali. Spotted with the profound dim timberland, pleasant shorelines, notorious volcanic mountains and lively coral reefs, Bali is an incredible spot to be in. Meeting and assistance on arrival and transfer to hotel. Evening explore the beautiful beaches. Overnight stay at the hotel. Morning after breakfast, proceed for a full day excursion to the Kintamani Volcano which will take you up in close contact with the true essence of Bali. Visit the Batuan Village (famous for traditional paintings), Mas Village (famous for Wood carving) & then past the Celuk Village (famous for silver and gold works). Followed by Goa Gajah Temple – which is a Balinese ancient historical temple. 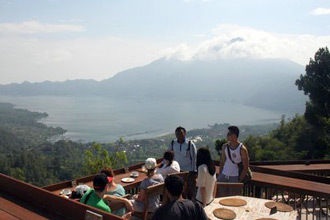 Stop midway at the Kintamani Penelokan along the foot of Mount Batur with a splendid Batur lake view. A scrumptious array of Indonesian / Indian lunch alongside this magical view will be a treat to all your senses (Lunch not Included). Later continue to Tengalalang – which offers a beautiful view of the rice terraces. Conclude the tour with the famous Ubud Village. Where in you can look in & around the various shopping options including the Ubud Art market. Overnight stay at the hotel. Morning after breakfast, proceed for a Spa treatment at Bali Orchids Spa or similar. Optional enjoy Water Sports activities on Tanjung Benoa Beach. Post lunch there’s no better way to spend a balmy tropical evening than a beautiful evening cruise (post dinner). With the sun going down you can set off on a relaxing cruise around the harbour. Enjoy the cool night air on the top deck, be entertained by live musical entertainers at the bridge deck, and relish delicious international buffet dinner. Later dance the night at the disco or enjoy our live cabaret onboard. This is definitely a treat for all age groups especially the honeymooners. Conclude this memorable evening at the sunset cruise which will always make you nostalgic in the future. Overnight stay at hotel. Morning enjoy a leisurely breakfast. 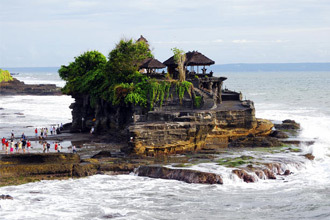 Post lunch enjoy tour to Tanah Lot…This unique tour displays the vivid aspects of Balinese culture & its amazing flora & fauna. The tour commences with a visit to the Tanah Lot temple, built on top of large rock in the ocean, it is also famous as the sunset temple but fabulously beautiful in the morning as well. The incredible location of this place enhances it a popular tourist spot. Overnight stay at hotel. Morning after breakfast, rest of the day at leisure or optional tour. Overnight stay at hotel. Morning after breakfast, in time transfer to the airport to board flight for your onward destination. Indonesia’s tropical beach paradise is one of Asia’s most attractive and popular tourist destinations. It is an island and a province in the southern part of the country, known for its wondrous landscapes that include jungles, picturesque paddy fields, beautiful coastlines and stunning coral reefs. The region offers visitors a chance to indulge in activities that are a unique combination of relaxation, adventure, culture and romance. With multiple languages and religions, the Balinese cultural tapestry is as rich as its geography. There is a visibly strong influence of Hinduism everywhere, and the region is predominantly Hindu. So it’s not surprising that Bali is referred to as The Island of Thousand Temples. Hinduism travelled here starting probably in the first century CE, as it did in other parts of Indonesia. And, like in India, it made way for Buddhism in the latter part of the first millennium, particularly in areas like Sumatra and Java, this in turn was replaced by the coming of Islam in the 14th century. However Bali, probably because of its geographical location, steadfastly remained Hindu. The decline of the Majapahits, the last of the Hindu royal dynasties, in late 16th century coincided with the time when Europeans were looking to colonize Asia. The Dutch East India company dropped anchor in Indonesia in 1602, and remained here as the colonial power till the country’s independence in 1945.